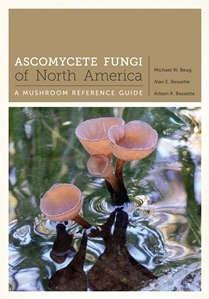 North America has a long tradition of producing excellently illustrated manuals on larger fungi and there is a new one maintaining that tradition, and equally as good, available on the book stands. Although such books cover fungi not found in the UK many of our familiar and less familiar larger ascomycetes are illustrated between the covers of this book, written by well known experts in the field. It is good to see good colored illustrations of British fungi but in addition the book allows the reader to see, experience, the full concept of a genus which perhaps is represented only by a single member in the UK mycota or at most a handful of species. How nice it is to-day-dream with such a book at hand and maybe, just maybe, you will be the first to recognize in Scotland at species, which at the moment is thought to be only North American species! The book starts with a beautifully illustrated introduction to basically all the ascomycetes, although the book itself only really deals with the larger forms and a spattering of the more conspicuous micro-forms. The introduction runs smoothly into an equally exotically illustrated key to those ascomycetes included in the book, with a small account on how to use the book’s key, which is quite unique and then follows a portrait gallery of the major types included. It is nice to see the recent molecular studies and modern interpretations being incorporated where necessary throughout the book. The first chapter (60 pgs.) is dedicated to the truffles, a group, which North America is host to many, many species and it’s pleasing to see some of these hypogeous fungi in all their intricate detail. The next chapters covered the elf cups, eye-lash fungi and their like – which makes up the largest number of entries (154 pgs. ), wart fungi, vegetable caterpillars and their relatives, (98 pgs. ), jelly babies, the bulgar and some micro-relatives, rarely seen in the finest glory even with a hand-lens (61 pgs. ), a single entry for the smelly Onegena corvina on bird corpses and feathers and earth tongues separated out as a family unlike the other groupings dealt with in the book, but little did the authors know that within days of the print drying this family would be made into an order in parallel to the other divisions used in the book! The next 4 chapters (final 13 pgs.) deal with fungi which are passed over by most macromycologists but none-the-less can be very prominent as well as bizarre. They include Neolecta irregularis, Apiosporina morbosa, Sciorias spongiosa and Taphrina occidentalis, the last representing a whole group of parasitic fungi, which are reduced in structure yet induce their host to swell and contort so offering a larger surface area on which the fungus can form their spores. The authors illustrate Taphrina occidentalis on Alnus rubra; in Scotland we have T. tosquinetii and T. amentorum, on leaves and catkins respectively on the related host Alnus glutinosa. There is an excellent glossary of terms which eases the pain some mycologists might experience and a wonderfully complete list of references so the more adventurous can seek further reading. An added bonus before the photographic credits and index is a list of common names which are most important these days when politicians and conservationists want to legislate but need to get their heads around fungus names. But one will find here several differences between those used in the UK and those used across the Atlantic, e.g Yellow Sap Cup and Yellowing Cup for Peziza succosa, Recurved Cup and Layered Cup for Peziza varia and Bladder Cup and Blistered Cup for Peziza vesiculosa to name but a few from a long list. However it emphasizes the need still to use Latin names for communication between professionals. The illustrations scavenged from a whole series of photographers are excellent and show their subjects in all ‘Sunday best’. The authors have amassed an impressive portrait gallery. I have few minor quibbles such as it would have been nice to see the yellow juice exuding from Peziza succosa, but things like this are few and really do not book to handle but use two hands because it is heavy, not a text for taking into the field. But you can savor it at home! It is aesthetically pleasing as well as being of great mycological use. I would recommend it to British mycologists as they will see their own taxa wonderfully illustrated as well being able to expand their knowledge of a genus by seeing exquisite pictures. A good buy. This review was published in the May-June 2014 issue of The Mycophile. Note: This review was first published on the Scottish Fungi website in April, 2014.